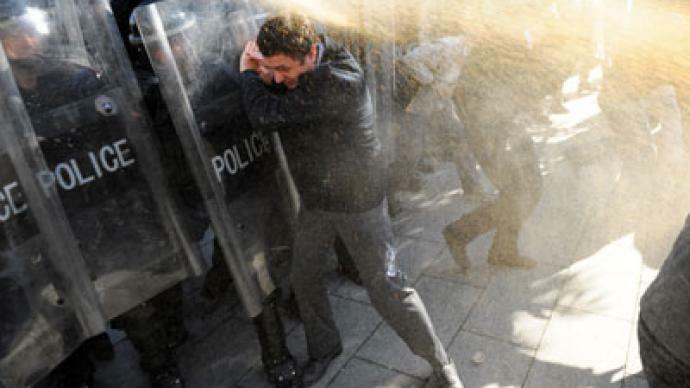 Opposition members threw tomatoes, paint and stones at officers in Kosovo on Monday as they protested against last week’s meeting between Kosovan and Serbian leaders. Police fired teargas and pepper spray in response. 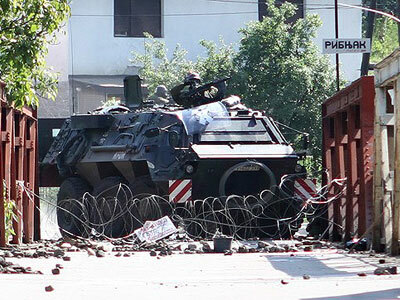 The clashes injured 18 officers. The protest was prompted by last Friday’s meeting between Kosovo Prime Minister Hashim Thaci and Serbian leader Ivica Dacic. 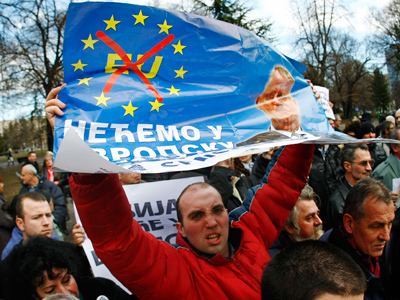 The demonstration, which was organized by hardline opposition group Vetevendosje (Self-Determination), was aimed at protesting against last week’s talks in Brussels between Thaci and Dacic. Activists say Pristina should not negotiate with Belgrade as long as it claims sovereignty over the breakaway province. They claim last week’s meeting undermines Kosovo’s 2008 independence from Serbia. Several Self-Determination members, including leader Albin Kurti, were detained along with several MPs. They were later released, according to local media reports. "Today's protest was to aimed at blocking the entrance for Hashim Thaci to come back to the government of Kosovo because we consider that today it should not be a normal day for Kosovo after the criminal meeting that was held between Thaci and Dacic," Visar Ymeri, a Self-Determination official and parliament member, told AP. Last week’s meeting was hosted by EU Security and Foreign Policy Chief Catherine Ashton and supported by the European Union. The EU has encouraged Pristina and Belgrade to solve the problems surrounding Serbia’s refusal to recognize Kosovo if they wish to make further progress towards EU membership. The talks were aimed at normalizing trade, transport, energy, telecommunications, and other areas between the two neighbors. "We agreed to continue the dialogue for the normalization of relations between the two sides and both committed to working together…we will meet again soon," Ashton said in a statement. Serbia’s two previous applications for EU membership were turned down over the Kosovo situation. In early 2012, the country finally became a formal EU candidate. But as Serbia continues to work towards EU membership, the European Commission says the country will be unable to do so as long as ethnic divisions exist within Kosovo. “Serbia still needs to achieve further progress toward a visible and sustainable improvement of relations with Kosovo, the key priority set out in the commission opinion on Serbia’s membership application,” the commission said in a report earlier this month. It was the first meeting between the two leaders since Serbia lost control of Kosovo following a NATO bombing in 1999. The next set of talks between the two prime ministers is scheduled for November. Kosovo’s 2008 declaration of independence was seen as highly controversial throughout Serbia and many nations worldwide. Within Kosovo it provoked protests among ethnic Serbs, who began setting up road blocks to prevent the ethnic Albanian government in Kosovo's capital from extending control over the Serb-dominated region in the north. 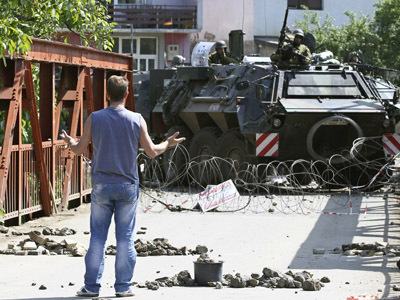 The move led to clashes with NATO soldiers. Belgrade has offered Kosovo autonomy within Serbia, but refuses to support its succession. Earlier this year, the EU issued a resolution asking all member states to recognize Kosovo. However, five countries within the bloc still refuse to do so. 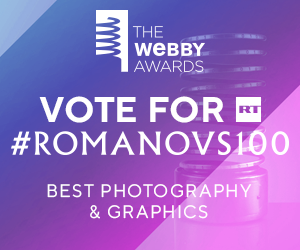 Those countries include Greece, Romania, Slovakia, Spain, and Cyprus. Outside the EU, it is not recognized by such international players as China, Russia, India, Iran and Israel. Kosovo leaders say its independence is both valid and irreversible.